Water damage in any area of your home can be a nightmare, but when it infiltrates your basement, the consequences are dire. Not only does your basement provide valuable extra space for storage or as another living space, it lies on top of your house’s foundation. 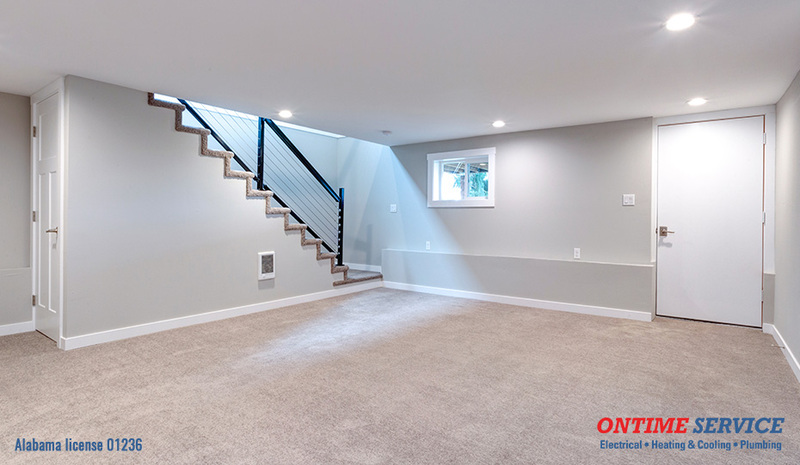 If you want to find ways to prevent water from entering the basement and threatening the integrity of your house, follow these tips from the pros at OnTime Service. Keeping your gutters clean and free of debris is a task you should prioritize year-round. If your gutter system isn’t working properly, water will run directly off your roof and pool around your foundation. This pool of water will eventually seep into your basement, resulting in expensive water damage. Avoid this nightmare by keeping your gutters clean. Once you have cleaned your gutters, make sure they carry water at least 5 feet away from your house. If your gutters are still allowing water to collect too close to your house, you can add gutter extensions. For about $10 a foot, you can hire a landscaper or waterproofing contractor to dig a sloping trench and install an underground pipe to safely carry water away from your house. This solution is usually better for the long-term than adding gutter extensions. Water can leak into your basement through gaps or cracks around your plumbing pipes. To avoid this issue, use polyurethane caulk or hydraulic cement to seal these gaps. In addition to the previously mentioned gaps around your plumbing pipes, cracks and gaps can develop in your foundation walls, allowing water to seep into your basement. We recommend using an epoxy-injection system for a longer-lasting fix. You can find epoxy repair kits that will provide everything you need. Although your gutter system plays a big role in directing water away from your home, your landscaping can be just as important. If the ground surrounding your home slopes downward toward your house, water can sometimes pool around your foundation wall, seeping into your basement. To avoid this issue, use soil to create a 6-foot-wide slope that drops 4 inches away from the foundation. For additional coverage, blanket the soil slope with a layer of 6-mil poly. Finally, conceal the poly with mulch, gravel, or a layer or soil-covered grass. Once you have made your marks, move the cover slightly off and drill the holes where you indicated. Then, peel back the protective film slightly. Put the screw through the bottom of the U-shaped clip and through the cover. Put the cap nut on the screw and tighten it with a screwdriver from beneath the cover. Lastly, remove all protective film and snap the cover in place on top of the well lip. Another overlooked contributor to basement water damage is the piping for your plumbing system. Cold water pipes produce condensation that can drip all over your basement floors. A good way to prevent this from happening is insulating cold water pipes with foam pipe insulation. With a wire brush, remove loose material from the walls. Following the application and safety instructions for your waterproofing paint, brush a generous coat of the paint to fill in every pinhole. Once the first coat has dried, add a second coat, brushing the paint in all directions to achieve full coverage. What Else Can You Do to Prevent Water from Entering the Basement? Call in the pros from OnTime Service! With over 40 years of providing professional home services to Birmingham-area homeowners, our team is ready to help you tackle any of your HVAC and plumbing problems. If you are looking for more solutions to prevent water from entering your basement, schedule an appointment with one of our knowledgeable experts today by calling us at 205-942-1405 or filling out an online service request form!